The standard heat of formation, ΔHfº, of a chemical is the amount of heat absorbed or released from the formation of 1 mole of that chemical at 25 degrees Celsius and 1 bar from its elements in their standard states. An element is in its standard state if it is in its most stable form and physical state (solid, liquid or gas) at 25 degrees Celsius and 1 bar. To phrase the definition in another way, the standard heat of formation is a special type of standard heat of reaction; the reaction is the formation of 1 mole of a chemical from its elements in their standard states under standard conditions. The standard heat of formation is also called the standard enthalpy of formation (even though it really is a change in enthalpy). By definition, the formation of an element from itself would yield no change in enthalpy, so the standard heat of reaction for all elements is zero. Hess’s law states that the change in enthalpy of a multi-stage chemical reaction is just the sum of the changes of enthalpy of the individual stages. Thus, if a chemical reaction can be written as a sum of multiple intermediate reactions, then its change in enthalpy can be easily calculated. This is especially helpful for a reaction whose change in enthalpy is difficult to measure experimentally. Hess’s law is a consequence of the fact that enthalpy is a state function; the path between the reactants and the products is irrelevant to the change in enthalpy – only the initial and final values matter. Thus, if there is a path for which the intermediate values of are easy to obtain experimentally, then their sum equal the for the overall reaction. A thermochemical equation is a chemical equation that also shows the standard heat of reaction. Recall that the value given by ΔHº is only true when the coefficients of the reactants and the products represent the number of moles of the corresponding substances. The law of conservation of energy ensures that the standard heat of reaction for the reverse reaction of a thermochemical equation is just the forward reaction’s ΔHº multiplied by -1. Let’s consider a thought experiment to show why this must be the case. Imagine if a forward reaction is exothermic and has a ΔHº = -150 kJ, and its endothermic reverse reaction has a ΔHº = 100 kJ. Then, by carrying out the exothermic forward reaction, 150 kJ is released from the reaction. Out of that released heat, 100 kJ can be used to fuel the reverse reaction, and 50 kJ can be saved as a “profit” for doing something else, such as moving a machine. This can be done perpetually, and energy can be created forever – of course, this has never been observed to happen, and the law of conservation of energy prevents such a perpetual motion machine from being made. Thus, the standard heats of reaction for the forward and reverse reactions of the same thermochemical equation have the same magnitudes but opposite signs. Regardless of how hard the reverse reaction may be to carry out, its ΔHº can still be written. An isolated system cannot transfer energy or matter with its surroundings. Other than the universe itself, an isolated system does not exist in practice. However, a very well insulated and bounded system with negligible loss of heat is roughly an isolated system, especially when considered within a very short amount of time. In mathematical and physical modelling, a hydrogen atom’s proton, a hydrogen atom’s electron and a planet are often treated each as an isolated system. A closed system can transfer energy (heat or work) but not matter with its surroundings. A system that allows work but not heat to be transferred with its surroundings is an adiabatically isolated system. A system that allows heat but not work to be transferred with its surroundings is a mechanically isolated system. 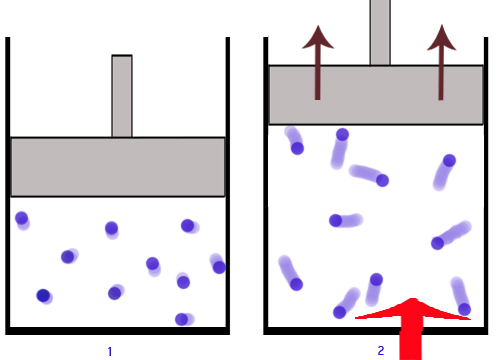 An open system can transfer both energy and matter with its surroundings.